Wifi connectivity problems when using X-AIR 16 with ethernet and router. We were using the built-in wifi on the X-AIR 16 successfully at rehearsals, but unsuccessfully live. Bought a router to create a stronger, more predictable wifi network. The Behringer-supplied mixing apps work just fine. The setup is great: amazingly stable even at crowded gigs. The Xair Monitor Mixer does not. Users can find the network and attach, but the application can't seem to find the mixer behind it. Since there's not much for us to screw up here, my guess is that it's a bug. Anyone else connect successfully through a router and ethernet? I think the vast majority of users use an external router, because it's near suicidal to rely on the built-in WiFi for a show. 2.4Ghz is too congested and the built-in wifi module is really weak. I'm not aware of any connectivity issues with XAir Monitor Mixer. My guess is that you're not connecting to the correct IP address. Behringer's apps scan the subnet they're connected to to find the mixer. My app currently requires that you manually enter the mixer's IP address. If you haven't changed the mixer's IP, then the default in XAir Monitor Mixer (192.168.1.1) will find the mixer and everything works. However, if you've changed the mixer's IP or (my guess is this is what you guys have done) you're letting the mixer DHCP (i.e. mixer gets its IP address from the router), then the address won't be 192.168.1.1. If you can connect with Behringer's app, I believe you can go to the network configuration screen to see the mixer's current IP address (I'm not sure; I always run the mixer as a DHCP server because I've found that to be more reliable). Once you know the mixer's IP address, just click on the IP address in XAir Monitor Mixer to edit it. Once changed, Xair Monitor Mixer will remember that IP for future runs. Got it. We're letting the router serve IP addresses, as that's how it's done 99% of the time. Except this time, I guess. We'll nail down the mixer with a static IP address as you suggest, and supply it to the apps. I'll let you know if this doesn't work. That'll totally work (though, for the record, I didn't actually suggest it ). Alternatively, you can use Behringer's app to find the IP address it received from the router via DHCP. Here's what that looks like in the PC app. Here's what that looks like in the iPad app. Well, tried it last night, no joy. Switched the X Air to "static" and ensured it was 192.168.1.1. Made sure app clients had 192.168.1.1 configured. Neither one could find the mixer. Behringer-supplied apps worked perfectly in this configuration. I guess the next step would be to disable DHCP on the router entirely, and use the mixer's DHCP server. We will try the app. 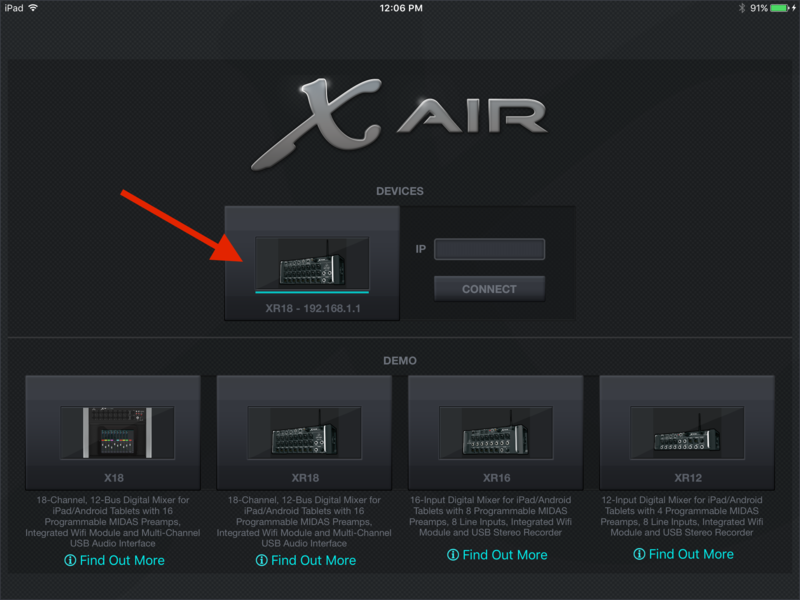 FYI - I strongly suggest you leave the Xair's network settings at their factory defaults, and then configure your router's DHCP server to reserve an IP address for the mixer via its mac address. This is way more convenient that setting up a static IP address on the mixer.